You are invited! If you are a student under the age of 20, and you can’t get to a church in your area, you are invited to attend Sunday School at Third Church right from where you live! Join us online from anywhere in the world for Sunday School classes via Internet technology. All you need is a computer or mobile device and the internet to join us. Our Sunday School roster includes students as close as upstate New York and as far away as Africa. You are welcome! We’d love to share in your spiritual growth and education. The best way to make sure to get you connected on Sunday morning is to filling out our online application form. 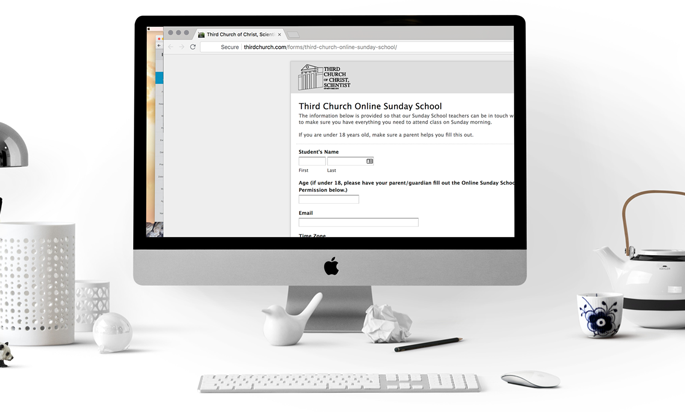 You can also Facebook message our Sunday School teachers through Third Church’s Facebook page to chat with them and get a feel for Sunday School before joining. They will be online to answer you on Sunday morning at 11:00 am. To find out more about our Sunday School please click here.